Our Conen Mounts electrically height adjustable mobile TV stands with two roller blinds can be easily adjusted in height. 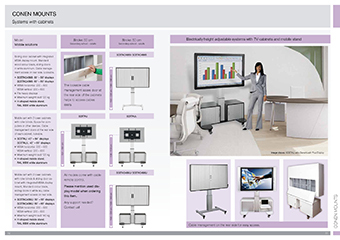 The roller blind TV cabinets provide enough space for documents and other important utensils for your presentation! The silver blinds and the TV cabinet doors are lockable at the front. The right lower cabinet offers you an excerpt for devices such as notebooks and laptops and a height-adjustable shelf. The left lower cabinet has two additional height-adjustable shelves. Another advantage of this system is the absolute freedom from maintenance - it never has to be adjusted, never lubricated or readjusted. 2 lockable roller blind TV cabinets made of 19 mm melamine-coated chipboard for the storage of desktop PCs, mini PCs, laptops, etc. Center to floor distance 13100 mm - 1810 mm 515.7" - 71.3"